Randy Finch's Film Blog: What Your Filmmaking Team Needs to Know About Copyright Enforcement and an Apparent Fall in the Rate of "Music Piracy"
What Your Filmmaking Team Needs to Know About Copyright Enforcement and an Apparent Fall in the Rate of "Music Piracy"
Stepped-up enforcement may be part of what's going on, but I'm still not sure that it explains all of the reduction in peer-to-peer file sharing in France (as pictured above) or for the recently reported reduction in the percentage of the U.S. Internet population using a P2P file-sharing service to download music. What's behind the reduction in illegal downloading? Is it a function of a maturing market? Are security measures getting stronger? Are customers accepting the new price points and the convenience of downloading via legal services like iTunes? Has the new RIAA strategy (less lawsuits against consumers - better relations with ISPs) and stronger government enforcement paid off? Kaiser Wahab (a media, venture, and tech attorney at the NY firm of Wahab & Medenica) recently wrote a post for Mashable about the new tactics that the US government is using to enforce copyright. But no one seems to know why illegal downloading seems to be in decline. 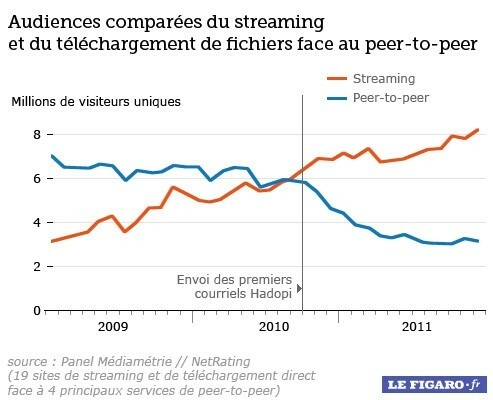 If musicians (like Radiohead) have figured out how to offer their music online and still make money - and illegal downloading is on the decline, does that suggest that filmmakers have a more secure future (with revenue models pioneered by the music business online)? What level of unpaid downloading should a filmmaker be wiling to accept as part of a broader marketing plan? According to this recent IFPI Digital Music report, only 9% of U.S. Internet users use P2P networks to download music illegally. What level of unpaid downloading is acceptable for filmmakers? Is a limited amount of unpaid file-sharing unavoidable? Can you use "pirates" to spread the word about your film? Should filmmakers accept a limited amount of illegal downloading as the new normal? To better understand how copyright law and business practices are evolving, online filmmakers and their advisors need to stay current. Although it could be easier to navigate and more user-friendly, Kaiser Wahab's blog offers a resource for filmmakers who are willing to put in the work. Not every filmmaker wants to become an expert in the latest developments in film financing (crowd funding), entity formation, how to operate your LLC and copyright issues - but you'll need someone on your team who knows this terrain.